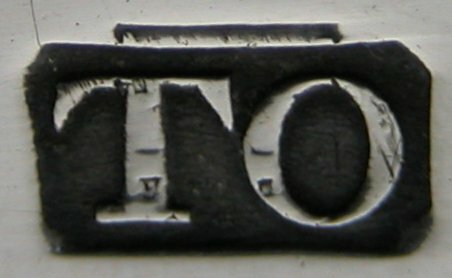 Thomas Ollivant was a Manchester maker, although his mark was registered in London. Thomas Ollivant registered as a Plate-worker in London in May 1789. It is believed that he was more of a retailer than a Plate-worker, buying London stock for resale, probably in Manchester. "Touching Gold & Silver", a catalogue of an exhibition at Goldsmith's hall in November 1978 discusses a cream jug with Thomas Ollivant's marks over-striking Peter & Jonathan Bateman marks. 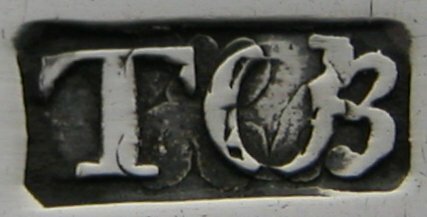 It therefore seems that Thomas Ollivant bought silver from the Bateman workshops and over-struck his own mark before selling the item. For all 4 pairs of tongs, the maker's mark is over-struck on top of another mark. With the first three pairs, the mark underneath looks extremely like it could be Hester Bateman's mark. The fourth pair are a little more interesting in that they are dated 1791/92. This means they cannot be Hester Bateman's work. Given the date, it is most likely that they were made by Peter & Jonathan Bateman. It is just possible that it is Peter & Ann Bateman's work except that the mark underneath does not look quite large enough to be Peter & Ann's early mark. Notice the overall style of all of the tongs and the similarity with Hester Bateman's work. My theory is therefore that Thomas Ollivant bought these tongs from Hester Bateman, over-struck with his own mark and then sold them.